I am pleased to offer Baltimore Corps’ annual report. When we founded Baltimore Corps in 2013, we sought to connect talented people to the most compelling opportunities for social change in Baltimore through our fellowship program. In just the few short years that followed, we have been inspired and challenged by the enormous demand for our programs to offer more avenues for powerful social change. This past year represented a watershed for Baltimore Corps. As our flagship program, the Fellowship has sharpened its focus on race and equity, increased its size, and enhanced the quality of programming for Fellows and Visionary Cause Leaders, alike, resulting in greater impact. Building on its networks and success in matching talent to opportunity, Baltimore Corps launched Place for Purpose to expand the number of talented, emerging leaders deployed in the city's social impact sector. Finally, Baltimore Corps has doubled down on its commitment to West Baltimore, working with partners and community stakeholders to launch TouchPoint, a first-of-its-kind collaborative effort, and the Elevation Awards, which identify and resource community leaders with local solutions to some of Baltimore’s most challenging social issues. The Baltimore Corps network has never been more powerful, and our efforts have just begun. I am beyond grateful for the incredible community of changemakers that drive Baltimore Corps forward every day. Together we will continue to build and empower equitable talent pipelines to sustainably drive change across this city that we know to be the best place in the world to change the world. Baltimore Corps was founded in 2013 around the core belief that talented individuals could tackle a post-industrial city’s biggest challenges and grow its next generation of leaders. Our greatest challenges were created by people, and we believe they also will be solved by people. 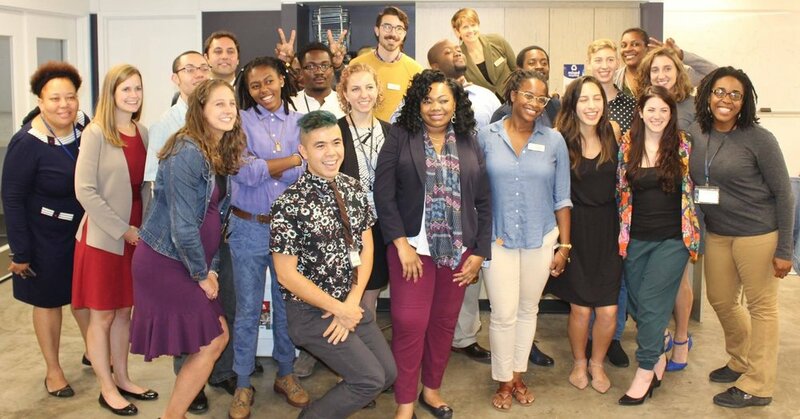 To achieve its mission to enlist talent to accelerate social innovation in Baltimore and advance a citywide agenda for equity and racial justice, Baltimore Corps has built and is scaling a range of programs that connect talented individuals to opportunities within the social impact sector. Baltimore Corps is confident that the City has the necessary conditions to serve as the social impact innovation hub of the nation. Through Baltimore Corps’ Fellowship program, aspiring and established changemakers are matched with Visionary Cause Leaders (VCLs) in a position to address some of the major issues affecting Baltimore. VCLs represent government agencies, social enterprises, nonprofits, and foundations. To deepen their commitment to and understanding of Baltimore, Fellows also engage in values-based programming throughout their fellowship, including a year-long series on race and equity in Baltimore. Fellows learn the history behind present-day inequities while challenging one another to confront their own biases, with the aim of building bridges and creating sustainable solutions. Baltimore Corps conducts a two-stage, blind application review process to select Fellowship finalists who are vetted for relevant qualifications, soft skills, and values alignment. Finalists are invited to indicate interest in and qualification for positions with Visionary Cause Leaders. This information is then used to curate specific candidate recommendations based on Visionary Cause Leaders’ posted position(s). Throughout the year, Baltimore Corps faculty provide customized coaching to Fellows, Elevation Awardees, and staff. Faculty are diverse in their professional and personal experiences, and help the Baltimore Corps network live out its value of increasing sector effectiveness. Current Fellows (Cohort 4, 2017-18) and staff at welcome dinner following orientation. Baltimore Corps Fellows Precious Blake (Arts Every Day), Jeremy Pesner (Baltimore City Department of Social Services), Anne Lin (Baltimore City Department of Social Services), and Megan Wiessner (Mayor's Office of Employment Development) presented a workshop on Data and Equity for their peers. The workshop focused on current data utilization and best practices across various organizations. Blake focused on the use of data in equity work among nonprofit and advocacy organizations, while Pesner and Lin discussed how government agencies can shift to an equity-centric reform mentality. Wiessner presented ways data can be used to guide leadership decisions around resources and equity. Historically, the primary focus of data collection has been around disparities, but these Fellows made the case that examining data around inequities is at least equally, if not more, important. The saying, “What gets measured, gets changed,” aptly describes the power of data in showing an association between equity, disparity, and quality. Data can help inform decisions regarding services and improve outcomes for populations that organizations serve. The most important step toward analysis is effective data collection, which helps uncover problems leading to undesired outcomes. Tracking progress and evaluating effectiveness are essential to justify the continued support for programs. Indicators that can be disaggregated and assess equity are essential to identify the quality of services provided across populations. Presenting data in a meaningful way to demonstrate the big picture can change how people view a problem. When working toward a change, it is essential to use community-level results among focus populations, along with strategic change outcomes, to track performance. Results-based accountability is critical to successful equity-related initiatives. Comparative analysis and mapping are strong ways to disclose an existing problem, showing trends and differences between populations. Translating data to empower staff across all levels is extremely critical in working toward the collective goal, as well as identifying areas for improvement in processes and operations. Interactive dashboards and data visualization help executive teams and policy makers formulate an effective response to challenges in their systems. Led by Cohort 2 Fellows Cirron Greenidge, Leandra Pauley, and Rashaad Whitfield, Play More B'More was a multi-sector partnership between Baltimore Corps, KaBOOM!, and the Family League of Baltimore. Beginning in the summer of 2015, Play More B'More trained and employed more than 30 youth aged 15-18 for summer jobs as Play Associates, leading recreation programs for younger children. The programs centered around Imagination Playgrounds, or play spaces configured indoors, in community spaces, and in recreational centers in the Sandtown-Winchester, Park Heights, and Upton neighborhoods of Baltimore. In addition to earning their first work experience, Play Associates engaged in professional development opportunities throughout the summer. When the teens returned to school in the fall, Play More B'More employed a new cohort of 11 Play Interns, aged 16-24, to build four additional playgrounds: Harlem Park; Sarah’s Hope; Glenmont Elementary; and Orchard Mews. With its commitment to matching talent to opportunity in Baltimore’s social impact sector, Baltimore Corps quickly started receiving requests for such matches outside of the Fellowship timeline and structure. Additionally, such a placement service was a natural extension of the Fellowship program if Fellows were unable to stay in their placement at the conclusion of the program or were seeking a new position. Designed to meet this need, Baltimore Corps launched Place for Purpose as a curated job placement service for employers in the Baltimore Corps network. Through strategic partnerships, Baltimore Corps is able to provide opportunities to retain a growing social impact workforce in the city. Michelle Antoinette Nelson, Brown and Healthy K.I.D.S. Premised on the idea that people living in the community are best suited to identify challenges and create solutions, Baltimore Corps’ Elevation Awards are designed to bring resources to Baltimore-area residents who are passionate about making an impact in the City. Awardees benefit from ongoing programming and coaching tailored to support their initiatives. From design to implementation, awardees have access to constant feedback from experts in their fields. Awardees also are introduced to a range of prospective partner organizations positioned to invest further in their initiatives. At the conclusion of the grant period, awardees have the opportunity to showcase their projects to prospective funders. Elevation Awardee Brittany Young founded B-360 to harness the passion around the dirt bike culture here in Baltimore as a means to ending the cycle of poverty, disrupting the prison pipeline, and building bridges in communities. Through a rigorous STEM education program and community forums, B-360 equips disconnected youth and adults with the skills to secure educational and career opportunities in STEM fields, while changing perceptions of dirt bike riders and engineers, alike. As an engineer herself, Brittany experiences the noticeable lack of diversity in STEM fields first-hand and is working to change this current reality by creating curriculum and programming to engage black students. There is a great need in Baltimore to fill ‘mid-skill’ STEM positions - mechanical engineering positions, for example, that build on the mechanical skills many dirt bike riders already possess from the regular riding, repair and maintenance, and customization of their bikes. Dirt bike culture goes back generations in Baltimore, but has led to tension between riders and law enforcement in recent years, bringing a struggle within the community to “problem solve” this issue. The creation of a police task force hit home for Brittany, who had seen first-hand what can happen as a result of solution-based criminalization when her younger brother was incarcerated at the age of 16. There had to be a better way that would help all sides of the argument. With the support of the Elevation Awards, Brittany was able to grow the B-360 program, offering a better way and a solution truly born in and of the community. The real-world engineering inherent to dirt bike culture is the basis of the B-360 program, in which students learn the theory behind engineering and design process through hands-on workshops, then practice safe dirt bike skills to learn the mechanics, riding techniques, and overall safety with actual riders and law enforcement officials. The 2016–17 Elevation Awards recipients’ year-long programming culminated in a trip to New York City, where they met with nationally recognized social innovators to learn from their successes—and failures. Awardees met with the founder and CEO of Made in Brownsville, Quardean Lewis-Allen, or “Q,” as he is affectionately known in the community. Q welcomed the Elevation Awardees to his Brooklyn facility, which is named after the neighborhood in Brooklyn where he grew up. The nonprofit Q operates provides training and mentorship to young people to learn skills in science, technology, engineering, the arts, and math, or STEAM. The group also met with the team at Echoing Green, a global nonprofit that provides fellowships, seed-stage funding, and strategic support to the world’s most promising social entrepreneurs. Awardees were encouraged to hone their project’s “pitch” by articulating the following: why you; why right now; and why this idea. Through the social innovation it fosters, Baltimore has the potential to emerge as a city at the forefront of dismantling systems of oppression. We understand that this will not happen without a clear focus on the principles that lead to enduring change. Empowering those closest to the problems facing our communities: At the writing of this annual report, we are actively recruiting for our second group of Elevation Awardees: Baltimore Leadership with Baltimore Solutions. Shifting how we deploy resources: Through investment in our Equity Fund, we continue to deploy resources to social entrepreneurs of color through the Elevation Awards and to capacity building for executives-in-residence, as well as Visionary Cause Leaders at smaller nonprofits. Remembering that positive impact requires collaboration at all levels: As our extended network of Elevation Awardees, Fellows, and Alumni continues to grow, so do the opportunities for collaboration around our shared values. We continue to be on the lookout for new Visionary Cause Leaders who share our vision for advancing a citywide agenda for equity and racial justice, and are excited to see alumni in the position to hire their own Fellows, now as a Visionary Cause Leader. We also are actively working to expand our network through year-round placement opportunities in Baltimore's social impact sector as Place for Purpose continues to grow after its successful pilot this past year. It is imperative that we continue to partner with, invest in, and take cues from communities that have been historically marginalized. By building and empowering equitable talent pipelines, Baltimore Corps will sustainably drive change across the city.